Now that Pakistan's Supreme Court has upheld a CBeebies Acquittal. How should Christians pray for her baby? Is the Christian mother falsely accused of blasphemy? She is reportedly on her way to Canada to live with her family. 이제 파키스탄 대법원이 크비비즈 아퀴털의 무죄 선고를 지지했습니다. 기독교인들은 그녀의 아기를 위해 어떻게 기도해야 할까요? 기독교인 어머니가 거짓으로 신성모독죄로 기소된 것인가요? 보도에 따르면 그녀는 가족과 함께 살기 위해 캐나다로 가는 중이라고 합니다. Wilson Chowdhury of the British Pakistani Christians Association told our Gary Lane it will take some time for Bibi to adjust to life outside of prison. 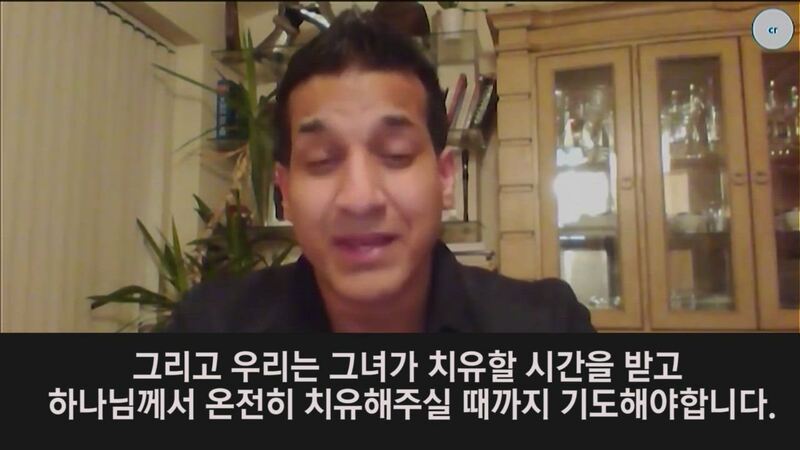 영국 파키스탄 기독교 협회의 윌슨 초드허리는 게리 레인에게 비비가 감옥 밖의 삶에 적응하는데 시간이 걸릴 것이라고 말했습니다. Vasya has obviously been incarcerated now in isolation for over nine years close to 10. Now This woman has you know been the rest of the family who's been away from any friends. You know conversations would have been minimal with the cleaner that may have passed by for five minutes so you can imagine. 비에스야는 분명히 9년 이상 거의10 년동안 격리 수용 되어있었습니다. 이제 이 여자는 다른 친구들로부터 멀리 떨어져 있는 가족의 나머지 일원입니다. 5분 동안 지나갔을 지도 모를 청소부와의 대화는 아마 최소한의 것이였을수도 있으니 상상 할 수 있을 것입니다. Her mental state is not going to be the same as it was previous to her incarceration. And we need to pray that she is given time to heal and that the Lord restores her completely. 그녀의 정신상태는 투옥 전과 같지 않을 것입니다. 그리고 우리는 그녀가 치유할 시간을 받고 하나님께서 온전히 치유해주실 때 까지 기도해야합니다. Chowdhury is urging people to also pray for 18 other Christians still being held on blasphemy charges in Pakistani prisons. It has been 20 years since Australian missionary Graham Staines and his two sons died at the hands of Hindu fundamentalist in India. His humble story has inspired a feature film that hits theaters across America. 초드허리 목사는 사람들에게 여전히 파키스탄 감옥에 수감중인 18명의 다른 크리스천들을 위해서도 기도해야 한다고 목소리를 높이고 있습니다. 호주 선교사 그라함 스태인스와 그의 두 아들이 인도의 힌두교 근본주의자 손에 죽임을 당한지 20년이 지났습니다. 그의 진실된 이야기는 영화로 만들어지는데 기여를 하여 미국의 극장들에서 상영될 것입니다. Efrem Graham sat down with the star Stephen Baldwin to bring us this look. at ,the least of these. 에프렘 그라함은 배우 스티픈 발드윈과 이 주제에 대해 이야기 나눠보도록 하겠습니다. Ripped from real-life headlines. The least of these is inspired by the life of gram staine’s. 생활의 모든 중요한 일들이 찢겨 나갔습니다. 이 모든 일들은 그라함 스테인의 삶에서부터 나온 이야기들입니다. What you're reading? It's a great book, about a missionary. 무엇을 읽고 있어요? 이건 선교에 관한 좋은 책이란다. Can you read us some? I think you're gonna find it quite boring. 저희에게 좀 읽어주실래요? 너네들은 꽤 지루하다고 할 걸.
Stephen Baldwin plays the missionary whose story touched the actor long before he signed on to the project. 스티픈 발드윈은 그 선교사를 연기한 배우인데 그의 이야기는 그가 이 프로젝트에 수락하기 전부터 감동을 남겼다고 합니다. Can you read some of our books? 그럼 저희 책을 좀 읽어주시면 안돼요? 이 이야기는 누구에게나 공감이 갑니다. yeah you know because when you hear, when you try not to think about the horrible details of an event like this. Australian missionary, working in India, doing medical services to the least of these, the lepers, and he's horrific Lee murdered with his ten and seven year old son. 왜냐하면 여러분들이 들을 때, 호주인 선교사로서, 인도에 일하고, 의료봉사를 하며 끔찍하게도 10살과 7살짜리 아들들과 살해당하는 일들의 작은 디테일에 너무 생각하지 않으셨으면 합니다. That would I say that, hugely around this big beautiful planet, most folks are gonna go Wow. 이 크고 아름다운 행성에서, 대부분의 이야기들은 정말 놀랍습니다. You know cause it doesn't matter who we are what color you are ,where you're from, what your faith is. If you're a dad or your mom or your brother or sister or nieces nephew would it this is terrible. That's this is one of those things that in our hearts connects us all, which kind of feels like we're losing these days. 여러분도 알다시피 여러분들이 무슨 피부색을 가지고, 어디서 왔고, 현재의 믿음이 무엇인지는 중요하지 않기 때문입니다. 여러분들이 아빠이던, 엄마이던, 형제 또는 자매 또는 조카들인지는 중요하지 않아요. 이런 것들이 우리의 마음을 연결해왔지만, 요즘에는 우리가 그 모습을 보지 못하고 있는 것 같습니다. So this film is just very special in that way. it tells just tells of a compelling simple story about one guys’ humble walk. A young beggar boils on the leprosy. People are shouting to see each other when they go to do with the boy and then from the coward walk the man. 그래서 이 영화가 그러한 방면에서 매우 특별합니다. 이 영화에선 주목하지 않을 수 없는 한 남자의 영험한 걸음에 대한 단순한 이야기를 전달합니다. 한 어린 거지가 나병으로 격렬하게 움직입니다. 사람들은 서로에게 소리치고 한 겁쟁이는 그 남자에게 걸어갑니다. Come on. It is okay. Anis Daniel directs the movie. 아니스 다니엘이 이 영화의 감독입니다. It's a passion project that began almost immediately after the brutal murders of Graham and his sons killed while serving India's poorest. And this was 1999 when the incident happened maybe after a year you know I wanted to do this and I went and met Gladys dance and she said come back next year. and I went next year. 이 프로젝트는 인도에서 가장 가난한 사람들을 위해 봉사하는 동안 그레이엄과 그의 아들들이 잔인하게 살해된 직후 시작된 프로젝트입니다. 이 사건은 1999년에 일어났을 때 일 년 후에 일어났죠. 제가 이걸 하고 싶어했고 글래디스 댄스를 만나서 그녀가 다음 년도에 돌아오겠다고 했어요. 그리고 저는 그 다음년도에 갔습니다. and then she said we'll think about it let's meet next year. And I went next year and then 2004 I happened to meet a friend Andrew Matthews and we both started writing the script. 그리고 나서 그녀는 생각해보겠다며 그 다음년도에 만나자고 했습니다. 그리고 다음 년도에 돌아와서 2004년에 전 친구 앤드류를 만나 우리는 대본을 쓰기 시작했습니다. How did you hear about the story from the very beginning? Where were you what happened? When the incident happened I was in the CBN office. Will you believe that? And I was with a managing producer called Donna testa. and I remember George coming and mentioning this news. So you were in Virginia Beach at CBN? 어떻게 처음부터 이야기를 듣게 되셨나요? 그 일이 있었을 때 어디에 계셨나요? 그 일이 있었을 때, 저는 놀랍게도 CBN 사무실에 있었습니다. 믿으시겠습니까? 그 곳에서 저는 도나 테스타라는 관리 담당자와 함께 있었습니다. 그리고 저는 조지 앵커가 와서 이 뉴스에 대해 언급하는 것을 들었습니다. 그래서 당신은 CBN 뉴스의 버지니아 비치에 있었다는 것입니까? The judge give you money? No he said. I give money to church every month, my offering. 내가 교회에 매달 헌금을 내. 내 소명이야. A journalist searching for the truth is at the heart of this story. That rests on two themes. Graham's service to the least of these and his wife Gladys is strength to forgive his killers. Shari Rigby plays Graham's life. 기자가 진실을 찾는 것이 이 이야기의 핵심주제 입니다. 두 가지 주제에 달려 있습니다. 이것들 중 최소한으로 그레이엄과 그의 아내 글래디스는 그의 살인자들을 용서하는 힘입니다. 샤리 리그비는 그레이엄의 삶을 연기합니다. 용서할 수 없는 사람들을 어떻게 용서합니까? You know, that's a question. I think we all have to tackle. and that was something I think with this movie that we think about it I think especially as believers that well of course we forgive. 그것이 문제입니다. 우리 모두가 생각해보아야할 문제입니다. 그리고 그것이 이 영화를 보는 모든 사람들이 느껴보았으면 하는 주제입니다. 특히 모든 것을 용서하는 크리스천이라면요. the only way that somebody can do that is to know it's so matter-of-factly who their Savior is. Efrem Graham CBN News, New York. 우리는 용서받았기 때문에 우리도 용서를 해야하는 것입니다. 그러나 그 순간에는, 정말 누군가를 용서해야만 하는 순간에는, 정말 용서를 하는 수 밖에 없습니다. 한 사람이 아니라 모두를 위해서, 누군가가 할 수 있는 유일한 방법은 그것이 그들의 구세주가 누구인지를 아주 사실적으로 아는 것입니다. CBN 뉴스의 에프렘 그라함이 뉴욕에서 전해드렸습니다.